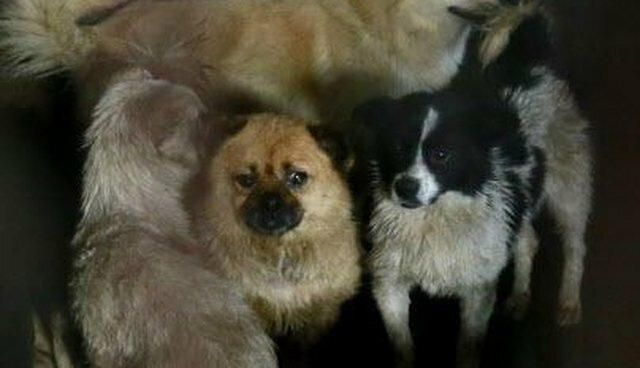 China's gearing up for its brutal Yulin dog meat festival - but rescuers saved one lucky dog before of the grisly event. 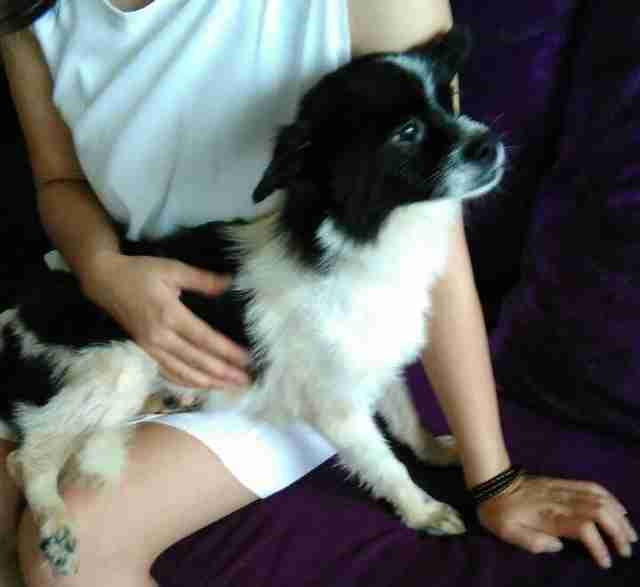 Humane Society International (HSI) found the little black and white dog cowering in a slaughterhouse last month during a trip to Yulin. 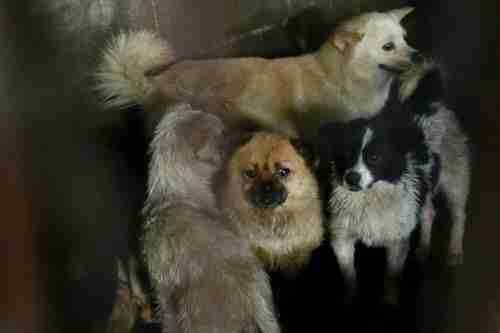 Terrified and filthy, Ricky was packed into a dirty cage next to his friend, a dog named Tom. The pair was next in line to be butchered. When HSI had the unexpected opportunity to rescue the pair and two cats who were found in similar straights, they jumped on it, whisking the four away to a shelter where they would be safe. Unfortunately, there are countless dogs just like Ricky who won't be able to escape before the June 22 dog meat festival. According to HSI, as many as 10 million dogs are butchered for meat in China each year, and 10,000 are killed for the Yulin festival alone. Ricky (black and white, right) and Tom (brown, middle) cower together before their rescue. Humane Society International. 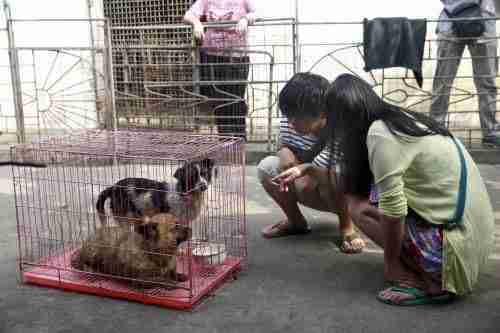 And a four-year investigation by Animals Asia revealed no evidence of any dog meat breeding facilities in the country, meaning that the vast majority of butchered dogs are scooped up off the street or even stolen from their owners' yards and sent to slaughterhouses - many of them still wearing collars. Groups like HSI and Animals Asia are fighting to end the cruel practice - which many believe to be a "tradition" but in reality was started recently by enterprising dog meat traders. Their efforts to halt the festival - and dog meat in general - have been backed by several celebrities, including comedian Ricky Gervais, who's also Ricky the dog's namesake. Cats watch as their friends are butchered in front of them. The one who's clinging to the wall wall was later rescued by HSI. Humane Society International. "I've seen the footage that HSI has captured on video, and it breaks my heart," Gervais said in a statement. 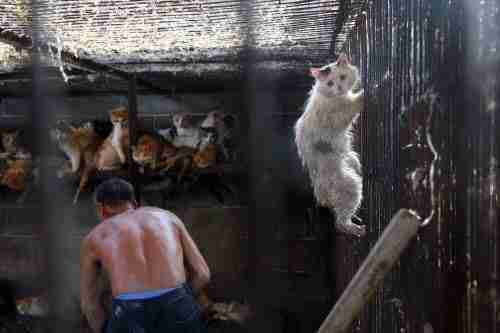 "I will never forget the look of bewilderment and fear on the faces of these poor animals - the dogs and cats await a horrible fate. No animal deserves to be treated like this." 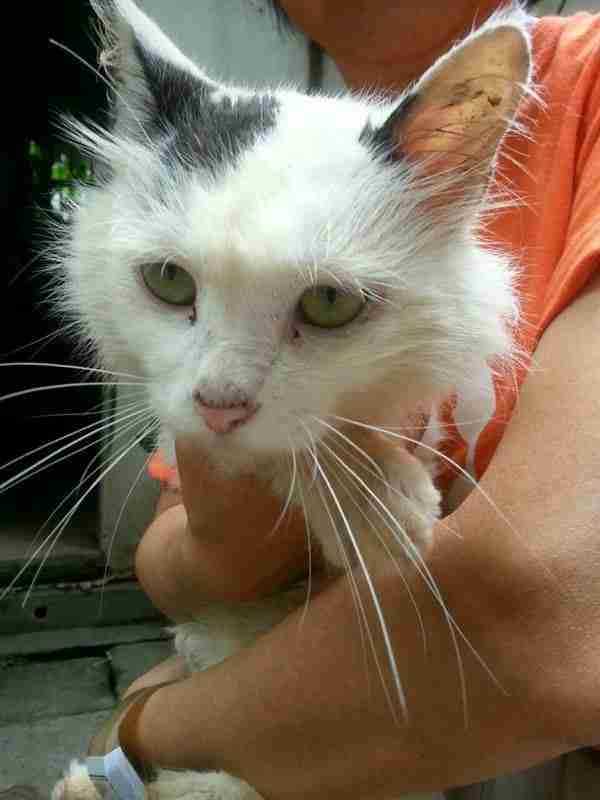 "One of the cats was so frightened that she climbed the wall of her cage to try to escape," he added. "I cannot imagine anything so dreadful happening to my cat Ollie-I would do anything to protect her." But at least the animals that HSI saved have a shot at a better future - though for one, help came too late. HSI said that Tom the dog was "extremely traumatized and ill" when rescued, and he sadly passed away a few weeks after his rescue, at long last surrounded by comfort and people who loved him. But the remaining three have bright futures ahead, and will one day end up with the families they deserve. 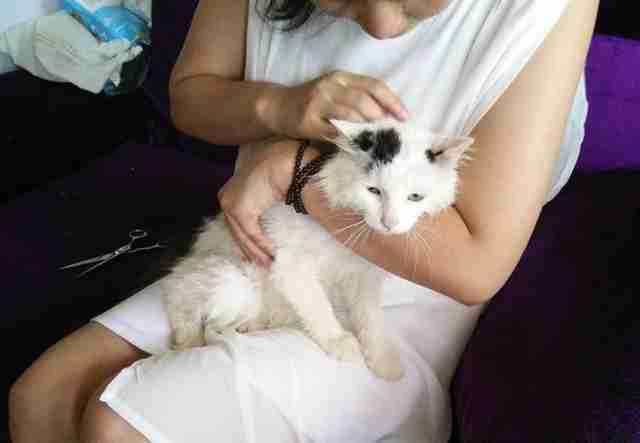 "The two rescued cats are both doing well and, together with little Ricky, will be found loving forever homes so that hopefully their Yulin ordeal will become a distant memory," HSI said. With just one week left before the festival, HSI is asking people to add their voices to those calling for its cancellation. 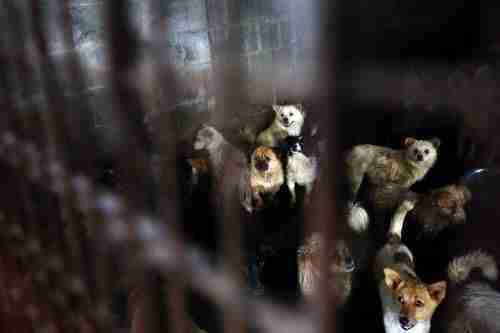 You can sign the petition here, and donate to the anti-dog meat campaign here.